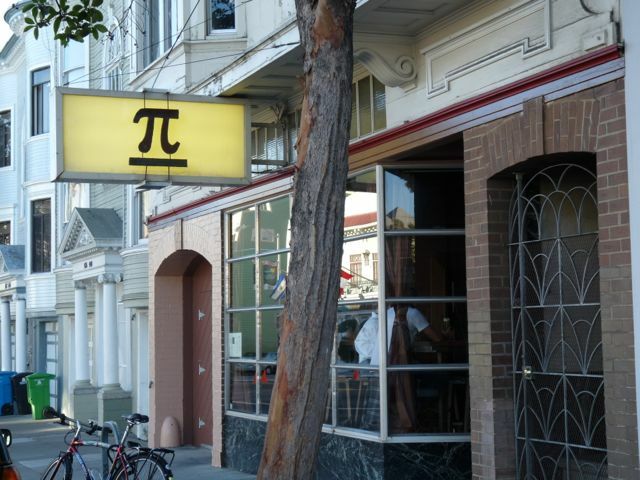 Opened in October 2009, Pi Bar in the Mission District, offers a solid lineup of beloved and innovative Northern California craft beers in 12 rotating taps, plus bottles and specials from farther afield. Regulars on the menu include Russian River Blind Pig and Moonlight Death & Taxes. Bottled Pliny the Elder is often available. The pizza is a simple hand-tossed New York inspired style. Pi’s pizza is thin-crusted and is made with quality local ingredients. Pastas, salads and a few other items fill in a limited but rotating menu that complements the fine beers. A few wine selections are also available. The interior surroundings are pleasant. There are no TV’s and music is kept at a background level making it an easy place for conversation. Families with children are welcomed. Extras: Happy hour from 3:14-6pm daily featuring a slice of cheese pizza and a pint of a featured draft beer. Plus you could easily walk 2 blocks to Rosamunde Sausage Grill and about five blocks down Valencia Street for some late night music at Amnesia afterwards, in an evening of quality beer-bar-hopping. From 24th Street BART, use “Exit A; 24th and Mission SW” escalator/stairs and walk west on 24th (slightly uphill). Turn left on Valencia Street. Pi Bar will be on the right at 1432, between 25th and 26th Streets. Look for the sign with the symbol π.